Mary Alderete lives in Seattle with her husband, son, father-in-law, and new family addition: a black lab named Midnight. She keeps a large library at home that is getting bigger every year with more books. When she's not reading and writing, she's out and about enjoying the Pacific Northwest outdoors. Mentors and Monsters is her first novel. Mentors and Monsters by Mary Alderete is a fiction book in the horror genre. It will appeal most to a horror loving audience of adults who enjoy sitting on the edge of their seats as they wait for the next horror to occur. The story follows Dylan, a human who works at an accounting firm, and the demon known as Han, who is a soul eater. Dylan’s desire for advancement caused him to sell his soul off to Han. However, Dylan’s time is coming to an end as, with each second, his soul comes closer and closer to being devoured. In a desperate attempt to save his soul, Dylan enters a new and dangerous bargain where for each soul Dylan manages to get sold, he gains more time with his own soul. Move over Abaddon, Crowley, and Yellow Eyes, there is a new demon in town who goes by the name of Han. 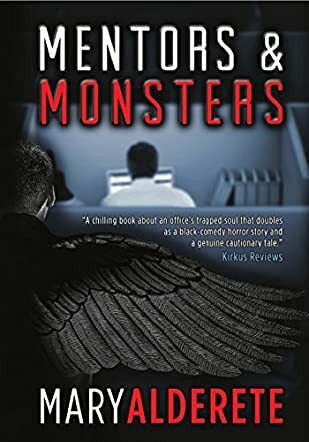 Mentors and Monsters by Mary Alderete reminded me a bit of the TV show Supernatural with how Han bargains for souls much like the demons in Supernatural do. I enjoyed the moral dilemma of the book in that the only way for Dylan to save his own life was to convince his coworkers to enter the same disastrous bargain that he himself regrets. My favorite part of Mentors and Monsters is the part where Han and Dylan compete to see who can get a person to sell their soul the fastest. I really enjoyed the dynamic of the final game as there was so much on the line for both the human and the demon. While I found Han terrifying at times, I also really enjoyed the demon as a character. I found Mentors and Monsters by Mary Alderete to be well written, with particularly well thought out dialogue between the characters. It is by far the best horror book I have ever read! Mentors and Monsters, the first work of fiction in the horror genre by author Mary Alderete, is definitely a book that is tough to put down once you've started reading it. Taking place in an accountancy office, readers will find lead character, Dylan, a flawed person with quite an issue. He's sold his soul to Han, a monster that needs to eat souls to survive, in order to get the thing he most wanted, a promotion. The only thing is, Han is ready to collect his debt, and Dylan doesn't want to pay. What Dylan is willing to do, though, is sacrifice any of his coworkers to Han for his own survival, and eventually, a duel of wits between Han and Dylan will seem to bring an end to this deadly game. Author Mary Alderete is a new author with great potential. Mentors and Monsters is a well-written, faced paced read that kept me racing through the pages, determined to find out what would happen next. Her writing style is crisp, settings are realistic, and her story line is unique, all unlikely things to find in a work by a debut author. Readers with a penchant for horror are especially advised to read this book, but all readers who love well crafted fiction should definitely give it a look. It's easy for me to give Mentors and Monsters my highest recommendation. I certainly hope that author Mary Alderete is already working on her next book. I, for one, will be eagerly watching for it! For Dylan, he's the best in Bay Area Financial Firm (BAFF) and his staff are incompetent people that couldn’t get by without his guidance and hard work. He doesn’t care if they hate him, he just wants the promotion that he feels he truly deserves. Unfortunately, Dylan had sold his soul to a monster that calls himself Han, and now Han comes to collect what is his. Being Han’s meal is agonizing, so Dylan makes a deal - he’ll get more people to sell their souls in exchange for more time. Other than the horror element, the office politics and drama in Mentors and Monsters by Mary Alderete will definitely remind most office workers of the reasons they hate their bosses and their jobs. This aspect makes the story relatable and the plot has some excellent twists. Character development is well-captured through the sharp dialogue. I give Dylan credit for being able to find a way to deal with the sadistic Han. Tyler, Lucy, Gloria and other BAFF staff are unknowingly embroiled in Dylan and Han’s game. On the whole, Mentors and Monsters is quite a read and a solid debut from Alderete. It would be quite something to watch if this story makes it to the big screen. It has the horror appeal that fans of the genre will love, combining the creepy factor of the monster, office wars, and the characters’ personal problems with a bit of theatrical flair. I’m definitely interested to see what other horror stories Alderete has up in her sleeve.